We know that posting has been sporadic since the holidays, (We sincerely apologize! However, we needed a vacation!) but don't forget that on January 3rd Barbie Martini will be kicking off the new year in super drive! Come check out our new fabulous columns, feast your eyes on our marvelous new facelift, and tempt your taste buds with our brand new martini recipes! Barbie Martini can't wait to share 2006 with you! We love our readers and want to wish them all a very happy and spectacular new year!!! Place the Amaretto, triple sec and lemon juice into a champagne flute and fill up to top with the champagne. Add a twist of orange zest to garnish. Pour all ingredients into a chilled glass and lightly stir. Place the sugar cube into the bottom of flute glass and add brandy. Next add the cherry brandy with champagne to the top. Float 3 black cherries top if desired. Looks like Lost star Michelle Rodriguez could be wearing those unflattering stripes soon. The actress was arrested on suspicion of drunk driving in Honolulu on Dec. 1, her second such arrest in two years. "We believe Ms. Rodriguez violated the terms of her probation," said office spokesman Frank Mateljan. "She now potentially faces up to 18 months in county jail." In June 2004, Rodriguez, 27, was sentenced to 36 months of probation stemming from a DUI in Nov. 2003 and a hit-and-run the previous July (both in the Hollywood area). Of the mounting infractions, Mateljan said: "Ms. Rodriguez should definitely take this seriously. It's a shame it's come to this point." Dang, Michelle always had that bad girl look but we never realized she was that bad! This looks like a good time to put down the vodka honey! 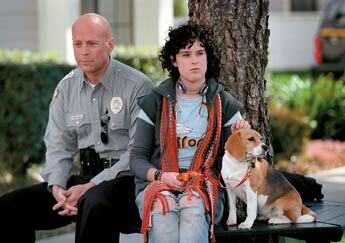 "Just heard that Kristin Cavalleri of 'Laguna Beach' will be guest starring on Veronica Mars. She will be playing a closeted lesbian cheerleader who turns to Veronica when a blackmailer threatens to out her and a number of other gay students at Neptune High. The episode tapes next week and will air in February." Go Team Kristin! We have a feeling Kristin will be the new "IT" girl of 2006! Courteney Cox has a phobia of telephones. The former 'Friends' beauty has confessed she hates speaking on the phone - except when driving her car. She admitted: "I hate talking on the phone. I just hate it. The only time I like talking on the phone is when I'm in my car. I don't like to sit down to speak." What girl doesn't like to gab away on the phone Courteney? That's what cell phones are for...They are made for talking and shopping, or talking and walking, or talking and whatever! Well as much as Cariel would like to make fun of Mischa skiing, (it just seems tooooo easy!) it really doesn't seem fair since Cariel can't ski herself! (Emily is a much better skier!) In fact, Mischa looks like she can out ski Cariel any day. Oh well, we're sure more pics of Mischa looking rotten will surface soon! 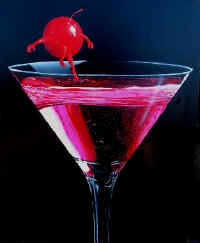 This Cherry Velvet Martini is definitely one you will want to get all wrapped up in! 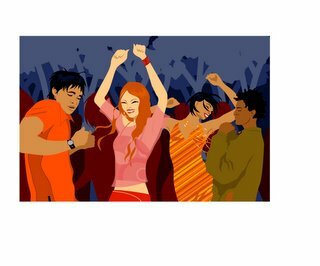 With the week coming to an end, and New Years Eve on its way, what are you waiting for?? Shake all ingredients in shaker with ice. Strain into martini glass. Garnish with a cherry. Bono has jokingly confessed he "flirts" with his daughters. 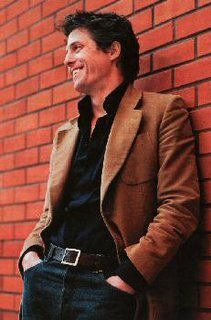 He said: "I'm such a flirt - but I've never met a halfway good performer who isn't. 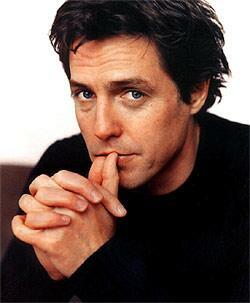 I'm surrounded by smart, intelligent, good-looking women that I can flirt with now, including my two daughters. I like the company of women." Boy oh boy! 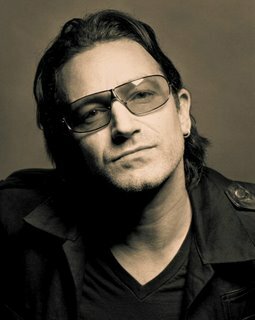 Those glasses Bono always wears used to creep us out, now we can't even find words nasty enough to describe him! We received this stuff from Santa and can't get enough of it! Not only does it make your lips super plump with a high gloss shine, but it freshens your breath with peppermint oil too! You won't be able to stop slathering this lip gloss on! When Joel Madden hosted his Bel Air holiday bash for the Dead Executives (his production team with brother Benji) this year, his brother Benji played host to Rumer Willis. In case you've forgot, Rumer is none other than the daughter of Bruce Willis and Demi Moore. Rumer arrived to the bash about 11 p.m., and Benji guided her through the masses, making introductions. We find nothing weird about the alleged new couple, however we do think it's weird that Benji and his brother Joel have matching under age girlfriends. Benji is 26 and Rumer just turned 17. Scarlett Johansson is the new face of L'Oreal. According to reports the Hollywood actress has been signed a multi- million contract to front the next campaign. A source said: "It's going to be a massive multimedia campaign, and Scarlett is making over $4 million dollars for her services. " Dang! L'Oreal if your reading: We will totally dye our hair any hideous color you want for just $2 million! Now that's a deal! After getting hitched in a lavish ceremony last year, Tori Spelling is planning her next wedding. She filed for divorce from actor hubby Charlie Shanian in October after just 15-months of marriage, but Tori has already found love again. She already has a rock on her ring finger. According to US Weekly magazine, Tori has gotten engaged to actor Dean McDermott, her co-star in her made for TV movie Mind Over Murder, which she filmed this summer. Dean apparently proposed to Tori after the pair took a moonlit ride on a horse-drawn carriage around a Christmas tree farm outside Toronto. "We have searched our whole lives for each other and can't wait to now start our lives as one," the couple said in a statement issued to the magazine. "We both finally found our soulmate and we are beyond in love." More like Dean McDermott is beyond in love with money. Tori sweety, can you possibly be that dumb? Okay, never mind. This year, why not ring in the new year with something different?! Instead of just popping a bottle of bubbly, make things exciting by transforming your boring champagne into a fabulous flirtini! 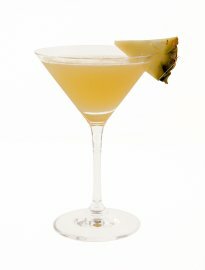 Combine chilled vodka, champagne, and pineapple juice in martini glass. Garnish with a pineapple slice. Ricky Martin and his "friend" vacationed on the island of St. Barth over the holidays. Both Ricky and his "friend" showed off their ninja moves on the beach. Actually they are probably practicing yoga or something, but Ricky doing ninja moves sounds so much better! Kelly Osborn wins it again! We're not sure what's worse, the hair or the horrific coat! Looks like Rotten Mischa spent the holidays in Aspen with her boy toy and a few friends. We have really been wanting to go on a ski trip lately, but if Mischa's going to be there making out with her nasty boyfriend we may have to re-think our plans! 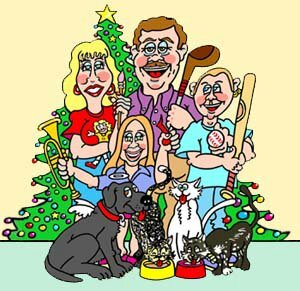 First off, we want to wish all of our readers a HAPPY, SAFE, AND FANTASTIC HOLIDAY! You really mean a lot to us, and without you we wouldn't be here! What are your plans for the holiday?? Let us know! We love our readers and want to know more about you! And, over your holiday break please leave us comments as to what you have been up to! We would love to hear all of your crazy stories and can't wait to respond with some cheeky comments of our own! Emily is leaving New York tomorrow morning to be with her friends and family in Kansas City for Christmas and New Years. Cariel will be leaving Springfield and meeting her family and friends in Kansas City also, but plans are still up in the air for New Years Eve... Anything could happen! We both can't wait to see each other and party it up in the KC area. Both Cariel and Emily will be checking in with the site and updating periodically until January 3rd . 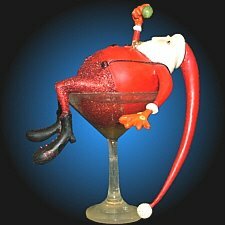 After that Barbie Martini will be kicking off the new year in super drive! We have some great new ideas in the works, and even a few new columns we will be adding! Cheers! We wish everyone a Happy Holiday and a very Happy New Years! Oh, and don't forget to toast those martinis for us! MTV staring in Teddy Geiger's "For You I Will (Confidence)". Start watching for Kristin's new video, but in the meantime take a look at these new pics of her and her Laguna posse! Who Is/Was Your Favorite New Kid?? Rank Em 1-5 Jordan, Jon, Danny, Joey and Donnie. Choooo Choooo! Can anyone hear the train coming? Mariah's snow bunny impression looks like one of those awful train wrecks! All that pink is so disgusting you can't stop staring! 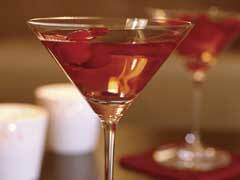 Dampen the rim of your martini glass and then line the rim with sugar. Combine eggnog, brandy, amaretto, nutmeg, and ice cream in a blender; process until smooth. Pour mixture into martini glass and garnish with a whole cinnamon stick. Christina Aguilera is done being Dirrty. Thank god. She recently said "I think the Christina look I had before meeting Jordan is well and truly in my past. I've decided on a classier image for the future - more fitting for a married lady." Cute! We're happy to hear that, and hope that Christina and Jordan are in it four the long haul. It's coming down to the wire and Santa's been watching... this quiz will help determine what you can expect to see under the tree this year. 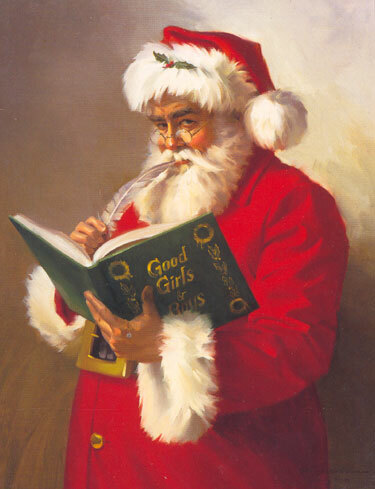 Were You Naughty or Nice This Year??? Emily was a little naughty and Cariel was nice this year. We are mad!!! One of our favorite designers Daniel Franco was eliminated last night. 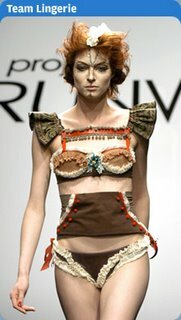 We thought his designs were beautiful, and it should have been Spawn of Satan Santino that was eliminated! His lingerie was horrible (the deer look), and he sold out his team and was super disrespectful to the judges during elimination. We think the only reason he's still on is because he's a drama queen and Bravo wants to keep him around for ratings. YUK! Now, we're rooting for Nik or the other Daniel. We're so sad to see Daniel Franco go. Seriously, Emily is devastated. 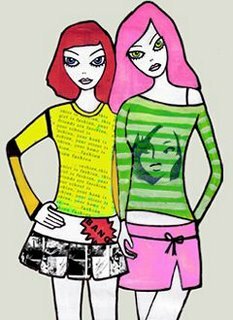 His designs are beautiful, and we will not stop till we track him down and have our own Daniel Franco originals!! :) So, if you're reading this Daniel, contact us! Pleeeeeease, we have to have one of your dresses! Kim Cattrall was in Sydney recently to promote her new book, 'Sexual Intelligence'. We love us some Samantha Jones, but we disapprove of that dress! Nothing seems to be "holding up" right. Bring us back that sassy Kim we all knew and loved! Renée Zellweger and country star Kenny Chesney's brief marriage is now officially over. The couple's annulment was finalized with court papers filed Tuesday in Los Angeles Superior Court. Zellweger said, "Kenny and I decided not to publicly discuss the details of our relationship because we felt that it would be a compromise of personal integrity. I admire Kenny and am grateful for the strength he demonstrated in choosing to honor our decision despite the difficulties." Why were these two even together? We can be sure when we say: This is one relationship that no one will miss! The teacup martini glass. 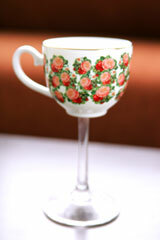 A floral printed teacup with gold foil trim and details is seamlessly blended with a standard clear glass stem and base. What an interesting new take on an old favorite. We can't decide if we like this idea, or it really freaks us out. Whatever the case, we had to post it since it's a martini glass! Fill your shaker with ice. Add gin and the juice of fresh lemon. Shake and strain into martini glass. Top with raspberry juice and garnish with fresh raspberries. We love Christmas quizzes so here's another one to help get you through hump day! Emily is a pair of socks and Cariel is fruitcake. Fun! Jessica was recently seen shopping at Agent Provacateur. Wonder what she got??? Sorry this post is a day late, but the strike in New York has gotten in Barbie Martini's way! That said, this was a big week for hip hop. 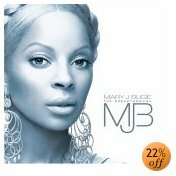 We're excited for Mary J Blige's new album. 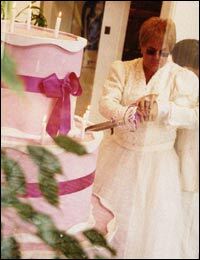 Elton John is the TRUE bridezilla! These pictures of Elton John in a wedding dress are ri-god-dang-diculous! Elton wore a tux for his real wedding, (thank god) but this joke is too funny not to share. 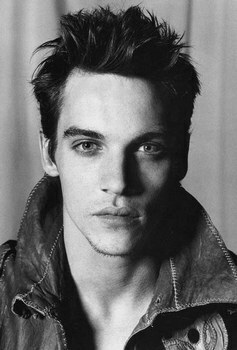 He's starring in Woody Allen's Match Point and has an impressive resume including our fav Bend It Like Beckham (he was the soccer coach). We're on the fence with this one. What do you think? Would you or wouldn't you?? Both Emily and Cariel say no. We realize that visiting your girlfriends family over the holiday's isn't always first on your to do list. However, some situations you just can't avoid...And your girlfriend probably won't forgive you if you miss this one. So listen up boys cause we have some helpful tips for you! 1. Be outgoing and be yourself, but remember its not your family. If chubby Aunt Martha starts talking about how hot her new lingerie is, make sure you know when to keep your mouth shut. Sometimes it's better to just take the back seat. 2. Don't get smashed! Many family's like to serve alcohol at their gatherings. It's great to have some drinks and join the family sing-a-long, just make sure not to throw up afterwards. 3. Sometimes it's better to lie. If big ole' grandma gives you a crochet snowman sweater you don't have to wear it. Say thank you like you mean it, (even though you think it's an ugly piece of trash) and that should be enough. 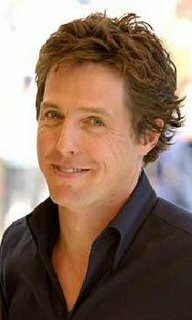 Since cute Hughey is our Hot Guy of the Week, we want to know which Hugh pic you think is hottest! There are some hard decisions to be made here ladies!